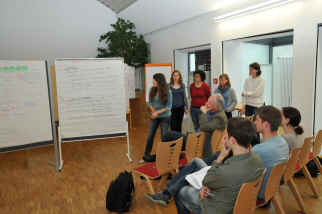 The promotion of young researchers is a central aim of the Transregional Collaborative Research Centre 23 (SFB/TR23). Therefore an Integrated Research Training Group (IRTG) “Vascular Cell Biology” will be set up at the beginning of the second funding period that provides training for PhD and (to a limited extent) MD research students on two levels: (1) training within the participating research groups, and (2) training within the network of the SFB/TR23. It will employ an internal tutoring / external mentoring principle and web-based video communication to disseminate lectures and seminars throughout the network. Completion of the program will provide young researchers with scientific competence as well as laboratory management and communication skills that will ensure individual success and long-term advancement in a seminal field of basic medical research.